Zoysiagrass (Zoysia japonica Steud.) leaves lose their green colour as they undergo cold acclimation (CA) in late fall in many regions, and delaying leaf senescence can extend their green period. The objective of this study was to investigate whether exogenous spermidine (Spd) and spermine (Spm) can delay leaf senescence by enhancing reactive oxygen species (ROS)-scavenging antioxidant enzyme activity. Mature zoysiagrass (cv. Zenith) plants were treated with Spm (1 mM) or Spd (1 mM) or water (control). The treated plants were grown under normal conditions or subjected to cold acclimation CA for 35 days. CA treatment increased leaf electrolyte leakage (EL) and malondialdehyde (MDA) level, decreased chlorophyll (Chl) content, and induced leaf senescence. 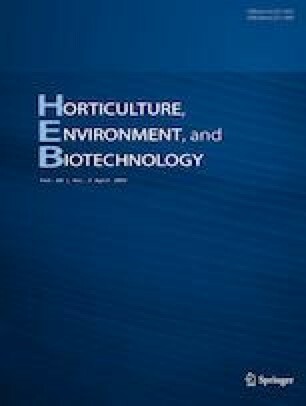 Foliar application of Spd and Spm reduced the decline in Chl content and reduced EL and MDA levels. CA treatment increased the ROS level and reduced antioxidant enzyme activity. Application of Spm and Spd reduced ROS accumulation and enhanced the activities of superoxide dismutase, peroxidase, catalase, and ascorbate peroxidase under CA conditions. The results of this study indicated that exogenous Spd and Spm at 1 mM can delay CA-induced leaf senescence through enhancement of ROS-scavenging antioxidant activity in zoysiagrass. Financial support for this study was received from the Fund of the Colleges and Universities in Hebei Province Science and Technology Research Project (Z2017004); the Scientific Technology Plan Program of Shen Zhen (No. JCYJ20160331151245672); the National Science Foundation for Young Scientists of China (31701955).